Hays states that Mies creates space in a way which it has no inherent qualities of its own. Users makes the space what it is. By interjecting society into a space, the space then has qualities due to its population. Does space differ on formal and cognitive levels? No. If a house is built on a beach, it is automatically a beach house. Users do not make a space irrational due to a lack of knowing how they will interact with the space. A space is a space. The use of the space may be defined by the user, but even the user’s intent of use cannot be irrational. Irrationality is the product of a rational syntax. True irrationality is not attainable. Form and space have fundamental physical qualities. Users of a space are predictable. Everything is thought about before acted upon. One cannot act without thinking at all. Kazimir Malevich, a Russian artist from the early 1900s, exhibited a piece which he believed to be a “zero form” at his 0.10 show in 1915 in St. Petersburg. This piece, entitled Black Square, is quite literally a black square on a white canvas. This form was meant to represent a void. Can a void be depicted in a 2-D representation? Can a void be represented at all? Even if an empty space is surrounded by something which gives it a sense of context and defines its shape, that is not a void. Nothingness is void. A void cannot be demarcated. 0.10 was full of Malevich’s irrational, yet rational, suprematist and transrationalist art. Malevich gave each piece a subtitle, such as, “suprematism airplane flying,” as to get the viewer to look for something nonexistent in the work. By giving the pieces of art seemingly meaningless titles, in an attempt to confuse the viewer, Malevich aims to make an irrational point, and fails. Although the subtitles may be irrational in regard to the work of art, his intent behind the subtitles is entirely rational. Black Square was placed in the corner of the room, the focal point of the gallery, where the icon would typically be. This makes a nod toward suprematism becoming a new religion. 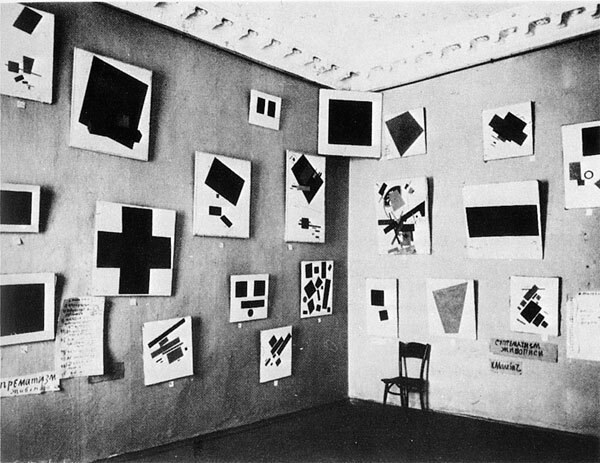 Malevich saw Black Square as perfection. He states that “the corner symbolizes that there is no other path to perfection except for the path into the corner.” One cannot arrive at perfection without a rational syntax. Despite the fact that Malevich rejected conventional sequences and form, he still utilized these entities, just in a radical manner. His rejection of establishment and normality through art does not mean his work is irrational. Although his final product may be irrational to the viewer, Malevich reduced art to a formulaic existence. By utilizing a rational system to create his irrational art, Malevich succeeded in creating art which appeared to be irrational to the viewer. Incomprehensible and irrational are not one in the same. “Zero form” exists as form without a social context. “Zero form” is not irrational, it is simply unattainable. Something is not irrational because it is built out of context or does not fit into its surroundings. The injection of users into a space automatically gives it a rational essence. Once form is put into existence, it is also immediately placed into a social context, even if that context happens to be a lack of social awareness. The plausibility of a built “zero form” is irrational. Void does not exist. Public spaces are created for people to use, especially in high-density environments where everyone does not own a plot of land. Some public spaces become these beautiful landscapes or these patches of greenery in the urban environment that provide relief from the surrounding concrete jungle. Although these spaces are deemed as public spaces their true purpose takes on the role of beautification and imagery. On the other hand there are public spaces that are programmed and in response become utilized. By programming the public space it allows the space to become more of an outdoor room allowing occupants to interact within the space. It is through the concept of interaction where a person starts to become one with its given environment. When spaces are truly interactive it exploits the individual’s ability to hear, see, taste, smell, and touch the surrounding physical world. Truly successful public spaces play with your senses. They surround you with beautiful imagery and vibrant scenery, allowing you too feel the abundance of textures scattered around. Successful public spaces also allow you to smell the bread from the bakery down the street, and the salt water from the ocean. Hearing the chatter of a nearby conversation, or kids laughing and screaming in a park in the distance. It is through these sensual combinations that give unique character and life to public spaces, and without these characteristics the space is just a space. Public space is only truly successful when people can interact not only with other people, but also with the space itself. The Madrid exhibition, at The World Exposition, really started to connect the dots for me on what really makes successful public spaces in the urban environment. Madrid has an interesting urban typology, which creates these voids within the fabric that act as urban rooms, and are reinforced by the surrounding environment’s posche. These voids throughout the urban fabric were photographed in the exhibition, and they were full of people and activities. Although I could only experience this from photographs, they still created beautiful montages of what Madrid could look like on any given day. By analyzing the photos further I started highlighting ideas that really made the pictures vibrant. Going layer by layer I started listing the architecture, the open sky, the natural landscapes, the amounts of people, the food, and the products. I started to question what really makes this space any different from city streets lined with trees, shops, and restaurants? Then I realized that there was no glass. Of course there was glass in the windows, but in the public container there was no glass that separated the people sitting at café tables eating beautiful plates of pasta and pizza, from the people in the plaza. Fragrant flowers were not in the stores, but rather being sold out on the sidewalk for people to smell, see, and touch. Nature was also being experienced with its outdoor environment and complimentary season. The public space that was captured gave the understanding of interaction and really played with the sensual emotions. The public space model of the open parks sometimes is just not enough to trigger the complex balance of program and emotions. City streets lined with stores behind glass walls become spectacles from the outside, and once inside strip away the public environment. I have started to call this idea the creep factor. The creep factor deals with the idea of allowing programs to not only be contained in their allotted space, but to also take advantage of the public domain, by finding their way to expand out of their physical container. It is when these experiences are transported from inside to outside that allow these public rooms to spark vibrancy within the space. This is going to be a very important consideration for China, which needs to seek extreme density in order to contain its growing population. With the Shanghai Expo promoting the idea of “better city better life” China is really trying hard to create a more sustainable and livable urban environment. One method that they began to tackle was the idea of creating ample amount of green spaces, including a plan to line the entire river’s edge with a green belt. Although these ideas are very noble, green spaces will not necessarily provide a better living environment. If China wants to be seen as one of the “greenest” cities then they should keep planting, but on the other hand if China is looking at creating a more vibrant city, my argument would be to look toward Madrid. By creating spaces that allow people to interact with their surroundings will create a better life for its occupants, which in return will create a better city, a people’s city. The tree does not exist. Does this tree even fall? If this tree is not real for anyone, it does not exist. How does one ground work in a living social context versus just raising consciousness? Trevor Paglen’s Experimental Geography: From Cultural Production to the Production of Space states that “humans create the world around them and that humans are, in turn, created by the world around them. In other words, the human condition is characterized by a feedback loop between human activity and our material surroundings. In this view, space is not a container for human activities to take place within, but is actively ‘produced’ through human activity. The spaces humans produce, in turn, set powerful constraints upon subsequent activity.” Does the space define its use or does the use define its space? Spaces are “produced” by its users. However, the inherent nature of a space also aids in producing human activity. Without human activity, space would cease to exist as a usable function. If the space remains unused, does it still exist as space? Or as a vacuum? A black hole? A void? If a real space cannot exist without human activity, how can one differentiate between an illusion and what is real? With no living social context, an entity is not in existence. When given a living social context, an entity becomes tangible, even if the entity only exists for the human who has produced this context. Is there a difference between reality and a dream world? 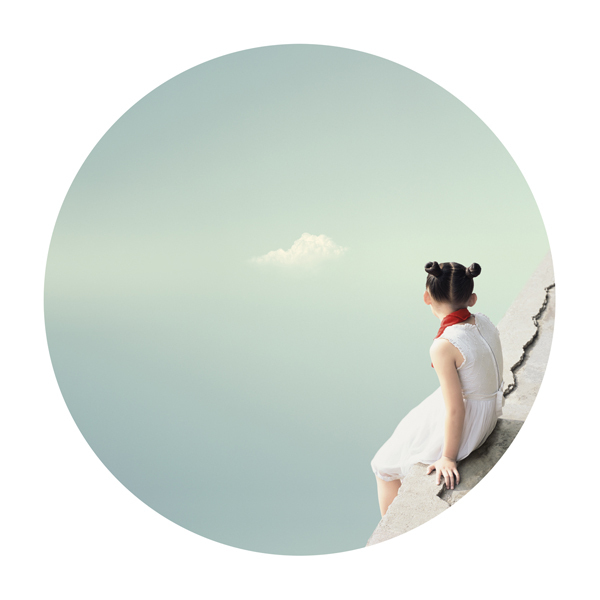 If the user is put into a surreal environment, this environment becomes real for the user. Because human activity has realized this environment, it exists for all users. Is one forced to become a member of society? If the surreal is real to them, why can’t one live in the surreal? Space does not exist if it has no user, yet the surreal can exist if it has one follower. In Beijing’s 798 Arts District, the artist Liu Xiaofang had an exhibit in one of the gallery spaces. 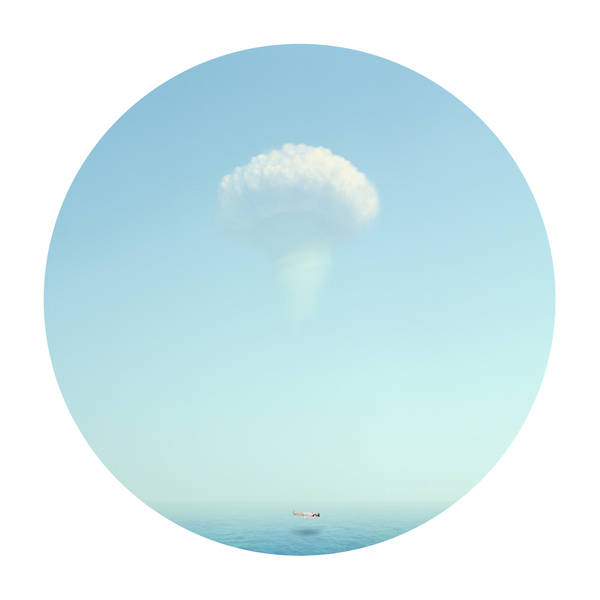 She writes, “we all have our own childhood memory, they can become twisted and unrealistic over time.” Her triptych depicts “a little girl…she seems emotionless with all her feelings blend into a state of day dreaming.” One image shows the girl staring at a cloud in the sky, while the next image illustrates the mushroom cloud of an atomic bomb. If this little girl has a daydream about the cloud in fact being a mushroom cloud, this bomb existed for her. The bomb then becomes palpable, if even only for the little girl. If a fabricated memory is remembered as the truth, this memory becomes real. The nonexistence of an unused space is similar to China’s censorship of free speech. To the Chinese, everything they are not allowed to be exposed to does not exist because they lack knowledge of it. To those who can see through the veil of censorship, censorship does not exist. If one knows that a censored item truly does exist beyond censorship, but one is not able to access it, what does this article become? Is it real? Fake? Nonexistent? Momentarily nonexistent? If an individual cannot express their thoughts because of the lack of free speech, these thoughts only exist to the individual. They do not exist for anybody else. For a specific user, if something does not exist for that user, it does not exist at all.